As most storytellers wish to have their primary narrative kept “pure,” transmedia extensions can allow for fan interactivity. Some media is inherently built for interactive storytelling, such as video games or online content. Others, such as music, can be difficult to structure in such a manner. 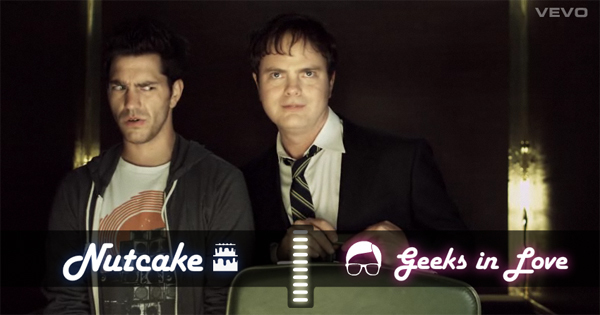 However, musicians have found a new way to involve their listeners: interactive music videos. These videos, often dubbed “Choose Your Own Adventure” videos (after the successful children’s book series) are a very recent innovation. Last week, the band Chairlift debuted their newest video, “Met Before,” which follows the two protagonists (real-life band members) as they make various decisions throughout one evening. As the viewer watches, they must repeatedly decide between two choices for the heroes and click the corresponding right or left button. This is by far the most successful interactive music video to date. In order to better understand the pros and cons of the video, though, it is helpful to first look at what has been accomplished in the past. While interactive fiction is something that has exploded since the advent of the Internet, it has existed to some degree since the 1970s initially with text-based computer games. Visual media came next. Frank Rose described in his book The Art of Immersion the first attempts at an interactive cinema experience. The company Interfilm premiered a 20-minute picture I’m Your Man in 1992 in a Manhattan theater, where viewers pressed color buttons on built-in pistol grips to dictate the direction of the film. Sony decided to fund a larger-scale feature Mr. Payback and released it in 44 theatres, but it failed miserably. The technology was not there yet, and feeling competitive with your fellow audience members over story choices is uncomfortable and stressful. 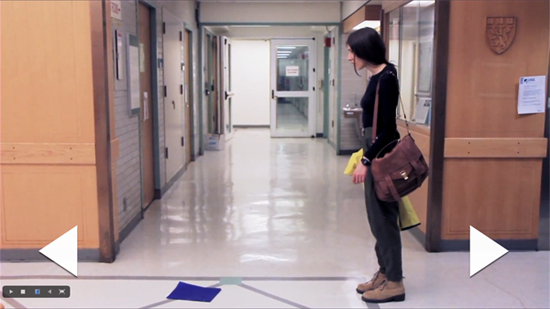 The interactive music video inherently circumvents this issue, as it is currently only viewable online. This will change in the future with developments in digital television, but even then, the audience will only be whoever is in your living room. From what I can discern, the group Riot in Paris released the first ever interactive music video in August 2010 on YouTube. With just a small budget to work with, the video was all shot on an iPod Nano and hosted on YouTube in different chapters. Each chunk used annotations for the viewer to decide where the story would go next. They would then be directed to the corresponding YouTube clip. This was a smart work-around for not having the expensive technology to make a truly integrated interactive video. The producers used the abilities of YouTube at the time to create a cheap interactive experience. While it should be applauded for being the first such video, there are some obvious flaws. Primarily, it is very clunky. The clips can’t audibly line up properly, as the creators weren’t sure exactly when users were going to click through to the next chapter. It’s also easy to skip around if one wanted to, as the videos are all visible on YouTube and easily accessible. This let the viewer easily stray outside of any narrative thread. The British group The Streets did a similar project in February 2011. “Computers and Blues” is more of a short film than a music video, featuring clips from the album dispersed throughout different scenes. The film utilizes the same YouTube tricks, using annotations to lead you to the next chapter, however the videos are unlisted so the user can’t jump around at will. They must follow their chosen story through to the end, which is an improvement on Riot in Paris’. It wasn’t until Andy Grammer’s “Keep Your Head Up” music video that the full content was held in one continuous and confined space. In October 2010, the video service Vevo debuted the interactive video, powered by Interlude’s technology. As the viewer watches the video, they are given a countdown to decide between two very explicit choices. No matter when you make your decision during the countdown, the next scene occurs when it should, leaving no gaps in the audio or video. The user is able to track their choices along the bottom of the screen, and at the end, they can share their version across social networks. The sense of ownership over their story is very important. The technology is a big jump, and one can imagine a vast array of opportunities it could be used for. What’s missing in this video is the content. For starters, the protagonist /viewer is not making active choices on what to do, they are merely choosing what event occurs next. This is not very engaging nor does it make one feel invested in their decisions. As for the story itself, the choices may dictate small differences in the next section, but the user is ultimately following almost the same exact path no matter what choices they make: Andy is outside, he ends up in the hotel lobby, he takes an elevator ride to a party, and the party follows him to the roof. The direction of the story can not change, merely details within it. This feels too controlled and limited, and does not invite repeated use. Chairlift’s video improves on these flaws. It does not have the jumping around and jarring cuts as did Riot in Paris’ or The Streets’ videos. Nor does it suffer from the same content choice issues as Andy Grammer’s. Using Interlude’s technology, “Met Before” runs seamlessly from one decision to the next, and the decisions lead to drastically different branching narrative. You could play this over and over and get totally different versions each time. The choices feel active, not passive, giving the user a sense of agency over the progress of the story. My only issue was that sometimes the choices were not clearly defined, so I would just haphazardly pick right or left. While Chairlift’s video is clearly an achievement, I think there is one missing piece that none of these examples incorporated. 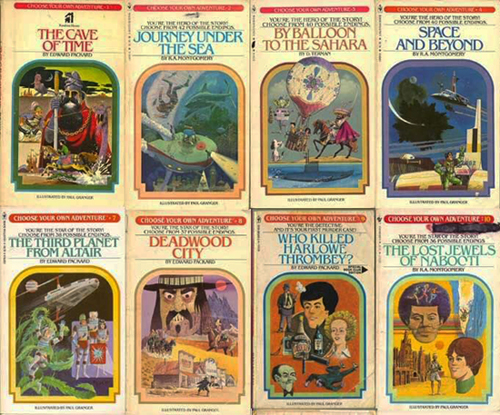 Many critics, writers, and the creators of these videos refer to them as “Choose Your Own Adventure,” in reference to the book series that made this style of storytelling popular. But the difference between the videos and these books is guidance. While a user wishes to feel like they have total control over where the story is going, they can also feel at a loss if they don’t know what the premise is at the start. When you bought one of the books, it had a pretty clear title (Secret of the Pyramids, Prisoner of the Ant People) and a plot set-up on the back cover. When the person started reading, they had a general understanding of who they were and what their main objective was. When any of these videos begin, there’s just no clear understanding of why. Why should the user do anything at all? In my first play of “Met Before,” the characters and I got stuck in a college lab for almost the entire video. Was I supposed to be doing something else? What is the point of them being there? By the third play, though, it became clear that their interactions with their classmates were related to the song’s lyrics. Users do not want a heavily guided experience such as Grammer’s video, but they do want a little nudge at the get-go, especially if there is some basic premise that connects with the meaning or intention of the song. This is the balance that future music-based interactive storytelling must strike. Now that companies like Interlude have made the technology possible, creators need to focus more on the story. Interactive videos shouldn’t just be for kitsch value or produced merely because it is possible. They should be utilized to create a very specific experience for the viewer. Why are you giving them agency? Is the conflict in the song something you want them to solve on their own? Do you want them to take on the character’s difficult decision? It is not simply a matter of handing them the wheel. You must give them a reason to drive.